Depending on where in the world you teach, the excitement of the holiday season may already be upon you. 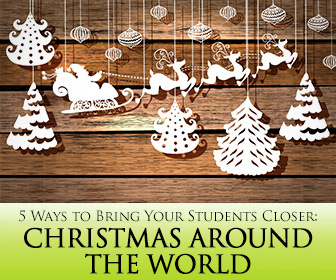 Many people around the world celebrate Christmas on December 25, and your ESL students may be some of them. Although Christmas is an international holiday, its traditions and symbols vary greatly throughout the world. If the members of your ESL class hail from different areas of the globe, they may have very different traditions when it comes to Christmas and how to celebrate it. The approaching holiday can be a good opportunity to bring your students closer together by allowing them to share some of their own Christmas traditions and sharing some of your own with them. Here are some ways you can encourage your students to share their culture with their classmates all in the name of the holidays. One of my favorite local traditions for the holidays is the display of Santas from around the world at PPG Plaza in Pittsburgh, PA. A dozen life sized fathers of Christmas and other symbols of giving are part of the Spirits of Giving from Around the World display. On their website, you can see pictures of each of these men (and women) along with a short blurb about the tradition from which they hail. If you happen to be in the area, bring your class to see the display. If not, send your students to the website to see pictures of the Santas or provide them with other pictures of Santas from around the world. In groups of three or four, have students look at the pictures and discuss how the Santas are similar and how they are different. Have each group make a list of their observations. Then challenge students to think about what each Santa says about the culture from which he comes. Invite your students to bring in a picture or describe a similar character from their own cultural traditions as well! In the American tradition, Christmas carols, or songs, play an important role in the holiday season. Share with your students how a traditional Christmas song or another holiday jingle is important to you. Then invite your students to do likewise about a song that is important in their lives. Their song might be a Christmas song, a holiday song, or another piece of music that means something to them. Invite brave souls to sing their song for the class. Whether they sing or prefer to keep their voices to themselves, ask each person to translate their song into English as best they can. Then put your students in groups of around four to read the lyrics and share their thoughts on the different songs. You might also want to give each group the lyrics to a traditional Christmas carol. Students should read the songs together and then discuss them. When do people in their home countries usually sing these songs? Is there a deeper meaning than what the words say? Do your students know the origins of the songs? Are there any similarities throughout the songs? What do the songs say about the holiday season or the reason we celebrate? After groups have ample time for discussion, ask individuals to share anything they learned or thought was interesting from the music discussion. One of the most popular traditions associated with Christmas is gift giving. Whether folks start shopping at the post-Christmas sales the year before or on Black Friday or even Christmas Eve, people want to give presents to the ones they love during their Christmas celebrations. Have a class discussion about gift giving. Do your students give gifts as part of their Christmas or holiday celebration? What types of gifts do they give? If your students are up to it, plan to exchange gifts within your class. You might want to explain what a Secret Santa is and exchange gifts that way, or you might prefer something a little less serious and have a white elephant exchange. Either way, set a spending limit and a time for sharing the gifts with one another. Holidays, no matter which ones you are talking about, are notorious for having food associated with them. For some holidays, the most families celebrate with the same food (think Thanksgiving turkey). Other traditional foods are very personal. (My family has had meatball sandwiches on Christmas Eve for as long as I can remember.) Some culinary holiday traditions are even notorious. (Fruit cake, anyone?) Invite your students to share about a food tradition that they celebrate either at Christmas or at another holiday during the year. You have several options for sharing a food tradition with the class. Bringing in your traditional dish is usually a hit with ESL students. It gives them a chance to taste something from another culture that they may not have had before. The same is true if each of your students brings in a traditional food of their own. Just eating is fun on its own, but you can also turn traditional food sharing into a chance to improve your students’ language skills! You might have each person give a two or three minute presentation on their dish and how it fits into their holiday traditions. You could also ask students to give a demonstration on how to make that particular food – either with real food or just inedible props or improve style, or write instructions on how to prepare the food and have recipe cards ready to hand out to the class. Christmas may be a popular holiday, but the winter is filled with other celebration occasions. Give your students a chance to share about the holiday that is most important to them this time of year. Have your students work with their classmates who celebrate the same holiday as them. For some students that may be Kwanza, Hanukah, Chinese New Year, or another holiday. Once students have determined their groups, have them work together to create a game, song, skit, or presentation that will teach the rest of the class the important information about their holiday. Holidays are a time to come together and show love and respect for people of different faiths and cultures. Giving your students a chance to share a bit of their lives with their classmates will make this year’s holidays like no other. Do you celebrate the holidays in your ESL class? What are your classroom traditions?